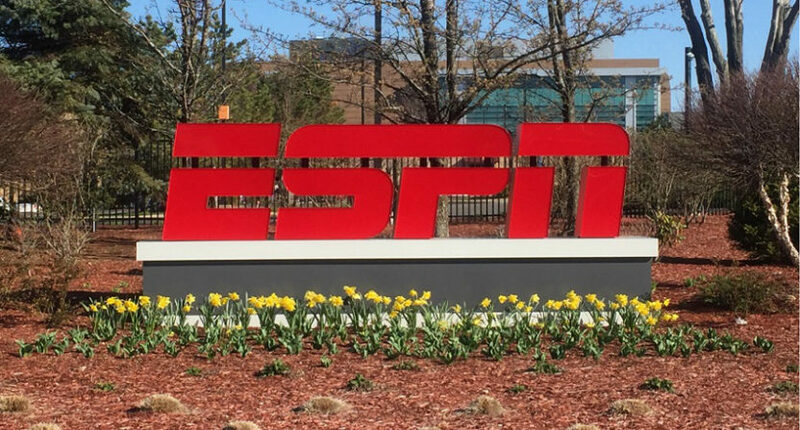 ESPN again was part of a Disney earnings drop, boosting the focus on their plans to go over-the-top. While many of the headlines from Disney’s Q3 earnings announcement Tuesday were about their acquisition of a majority stake in BAMTech and their plans to launch an expanded ESPN over-the-top service and a Disney over-the-top service, the actual results (available as a PDF here) are also worth perusal, especially for how they apply to ESPN. Disney’s overall diluted earnings per share dropped 5 per cent from Q3 last year (from $1.59 to $1.51), while their net income fell nine per cent (from $2.597 trillion to $2.366 trillion). And, once again, the ESPN-including media networks segment was a big reason why. Cable Networks revenues for the quarter decreased 3% to $4.1 billion and operating income decreased 23% to $1.5 billion. Lower operating income was due to a decline at ESPN. The decrease at ESPN was due to higher programming costs, lower advertising revenue and severance and contract termination costs, partially offset by affiliate revenue growth. The programming 3 cost increase was due to a contractual rate increase for NBA programming, partially offset by a decrease in the cost of time for ESPN programming aired on the ABC Television Network. Lower advertising revenue was due to a decrease in average viewership and lower units delivered including the impact of two fewer NBA finals games, partially offset by higher rates. Affiliate revenue growth was due to contractual rate increases, partially offset by a decline in subscribers. Of course, the broadcast networks’ world isn’t great for Disney at the moment either, as it saw a 22 per cent drop in operating income that was almost as large as the cable networks’ fall. However, the cable networks’ operating income is so much larger ($1.462 billion versus $253 million) that it’s a much larger piece of the puzzle here. Some of those costs (contract termination in particular, which is about some costs from the massive April layoffs landing in this quarter) aren’t recurring, and actually were taken to cut costs, but the higher programming costs (the NBA in particular) are, and lower advertising revenue and a decline in subscribers (even if ESPN’s still ahead of FS1 there) are certainly problematic entries. That helps to speak to why this ESPN over-the-top service, now with a launch date of “early 2018” and significantly bolstered with more content than their original plans, is a key target for the company. Disney CEO Bob Iger said on their earnings call Tuesday that “This is a real priority for us as a company in terms of getting it right.” It’s a way to get cord-cutters to pay for ESPN, and also perhaps a way to upsell those who already have ESPN access and want some more specific sports content (details of fees aren’t out yet, but there will be additional content available for a price). It’s also an edge on the advertising side; Iger confirmed that this OTT sports content will have ads, and talked about how BAM Tech’s ad technology can be a key revenue source for them, especially as they have a better idea about user identity and preferences through streaming services than they do on TV. And Iger said this is a way for ESPN to make some more money from the different rights they have. Of course, this is tricky, as new ESPN OTT subscribers won’t be subscribing to ESPN through traditional cable or satellite bundles (and thus, won’t be paying that per-subscriber fee). And ESPN will have to find the balance between attracting new customers who have already cut the cord and encouraging others to cut the cord. Iger said they’re looking at all those factors when considering price points, though, and their goal is more about attracting new subscribers than getting current ones to shift to OTT. “We don’t enter this with a notion that we’re going to cannibalize our existing product significantly, but we have considered the impact on that,” he said. So, we’ll see where things go for ESPN. But it’s clear that they’re making a big bet on this direct-to-consumer approach. And the endless string of “Disney earnings hurt by ESPN” results is probably a big reason why. ESPN still matters linearly, but it’s taking significant hits there. Disney’s hoping that this over-the-top service will help ESPN regain some of that revenue and some of its momentum. We’ll see if they’re right.